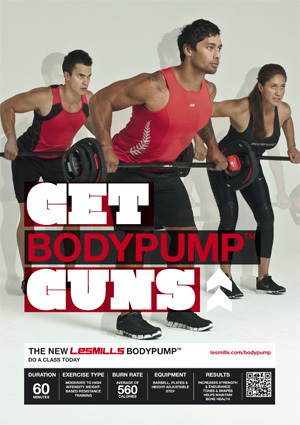 39 Responses to "BODYPUMP 82 tracklist"
Oooouuucchh! I’m in agony every time I teach 81! It’s ripping me to shreds! Good help us all if lunges is harder! Wow, that’s an awesome track list this release. Usually there’s quite a bunch of tracks that I feel are meh without the workout … but I love a whole lot of ’em right off the bat. very disappoint with the music selection !!!! Ecuador! Fantástico! Algo latino al fin! Ecuador! Fantastic song! Latin lyric! I love it! ahhhhh slow down, only just launched 81 at our club last night!!! I LOVE this release. I cried during the warm up! I do think that BA, BP, BS and BB are some amazing releases coming! See you at GFX Glenn! Any hints on what’s in BODYSTEP? Thanks, Glen! Wow, Ecuador on Body Pump! I cant wait! Quite a slow back track after Ravers Fantasy I think, but I like the track. Also a bit disappointed to see another Adele track, but it’s a good mix of it. someone like you souds bad, would have been better for the calm down and no squats. I am a fairly new LMI Instructor but an old time pumper… LOVE LOVE LOVE THIS TRACK LIST 🙂 can’t wait to see it!! Glad that my request ‘raining diamonds’ is on this release :D, otherwise looking forward to this release! I was also at filming but I had already forgotten most of the songs.. This tracklist really reminds me of NZ, it was a great stay and I miss those classes. Awesome release and much much better music selection than BP81. Cant wait for the release in one month. Thanks Glen for the post, I hope I will see you again in one filming! (I have to start saving money again, hehe). I’m excited for this release based on this tracklist! 81, didn’t hit the spot for me musically. I have to admit it took me two weeks to get used to the squat track. The music selection for the class is awesome. BRING ON RELEASE 82. Whenever that may be. Shouders track is the best. I love that song. Loved it on BC 29.
great playlist but we need a little bit more time on ABS track 9…make the biggest one ver in a future release!!! why do they keep repeating old pump songs???!?!?!? Did this release for the first time yesterday, but out of pump action for a while, this release is awesome. I didn’t like BP81 but 82 is fantastic, very good workout – I was concerned over the back track, it starts very slowly but when it hits it hits hard. Squats are one of the easier squat tracks in recent memory but that is more than made up for by Triceps (yep I thought triceps were a hard track), lunges and shoulders which are both incredible. My only complaint is as above the Ab track is very short – That song would be perfect if it could be extended – I’ve wanted that track as the Pace track in RPM for a long time it has perfect 30 second blocks of sprint/recovery allowing you to go full throttle than make a full recovery. I agree the ab track is too short – those mountain climbers still hurt though! I do like the release though can’t wait to kill the tricep track! What ever happened to using the song Time To Say Goodbye from Andrea Bocellie? Can someone please tell me that?